Volnei Sant'Ana was born in Porto Alegre, Rio Grande do Sul, in 1961. A self-learner artist, he started painting at the age of ten. 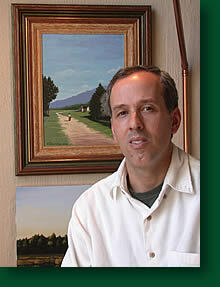 The artist portraits landscapes in which he tries to highlight the realism of colors, lights and shades. I usually make sketches of the painting at the site chosen, capturing colors, tones, lights and shades. At that time I measure the perspective and the depth of the painting to be carried out afterwards and photograph the site according to the solar position of that specific moment. These resources allow me to have a precise and accurate reproduction of the landscape. Subsequently, in my studio, I do my very best to put on the canvas all the images I have captured not only with the lens of my eyes but also with the lens of my heart, as real as these images can be. In the latest years I have been describing vividly landscapes from Rio Grande Sul, Santa Catarina and, our close neighbor, Uruguai.